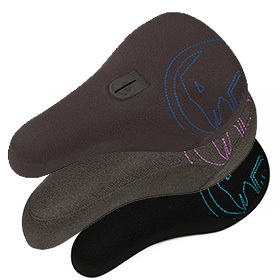 Lightweight padded pivital design from Cardinal bmx **Gray with Teal base**..
* just the right amount of padding & durable materials * .. If you’re in the market for a new seat and looking for something real clean and simple, look no furt..
We also have the smaller seat to match the new “Dos 20” seat. Using the patented and proven “Tripod”..
With the same spec’s as the Roey seat, featuring the wider Tripod base and slimmer refined foam shap.. Stylish Railed seat from Fly Bikes- Kevlar Black Top- Color accented base- Slim size.. Stylish Railed seat from Fly Bikes- Kevlar Black Top- Color accented base- Mid size.. Thick foam padding for comfort and low profile silhouette Strong and lightweight Tripod seat desi..
Stats Slim foam padding for comfort and low profile silhouette Strong and lightweight Tripod s..
Mutiny Tripod MID Seat features a tripod mounting system and qualitty synthetic leat..
Stitch Mid Stats Thick foam padding for comfort and low profile silhouette Strong and light..
NEW limited edition German Raindrop Camo seats available. They are made from repurposed vintage m..
NEW Faux leather covered with embossed Slugger logo. New custom Monogram access patch. B..
Here’s our Tom Dugan signature Tripod seat. We worked with Tom to produce a simple slim seat design .. Constructed from re-purposed vintage military canvas which we sourced from downtown Los Angeles. Arm..
Our Wrenches seat will now be available in a Tripod version in this nice distressed black material w..
Our Wrenches seat will now be available in a Tripod version in this sweet distressed brown material ..
Primo Balance saddle. Features: Vinyl top with Kevlar corners SA9112 features forged alloy rails 9mm..
Primo Fat Pivital - Black..
-Fat pivotal seat with three different unique upper materials and embossed rear logo.-Pivotal S..
Primo Slim Pivotal Seat with a 1-pc vinyl top, custom Primo logo access patch to the hollow Pivotal ..
You Need fries with that seat? The RANT Fried Pivotal seat features a new reinforced pan, with lo.. The Rant Believe Pivotal Seat takes you to the furthest reaches of the galaxy in search of… Featurin.. In the past, we have collaborated with Simone to bring some very interesting and unique seat designs.. The Shadow Conspiracy "Penumbra" Pivotal Seat - Simone Barraco | Series 6 is the signature seat of.. The Shadow Conspiracy "Penumbra" Pivotal Seat - Simone Barraco | Series 7 is the signature seat of.. The Shadow Conspiracy "Penumbra" Pivotal Seat - Mark Burnett Series 4 is the signature seat of Mark .. The Shadow Conspiracy "Penumbra" Pivotal Seat - Joris Coulomb Series 4 is the signature seat of Jori.. The Shadow Conspiracy "Penumbra" Pivotal Seat - Joris Coulomb Series 6 is the signature seat of Jori.. The Shadow Conspiracy "Penumbra Mid" Pivotal Seat - Trey Jones Series 7 is the slim version o..
Trey Jones series 8 Pivotal seat system - New Coffin Pivotal patch (Pivotal only)- Weight: 335g.. The Shadow Conspiracy "Penumbra Mid" Pivotal Seat - Kevin Kalkoff Series 3 is the signature seat o.. The Shadow Conspiracy "Penumbra" Pivotal Seat - Lahsaan Kobza | Series 6 is the signature seat of .. The Shadow Conspiracy "Penumbra" Pivotal Seat - Mark Burnett Series 3 is the signature seat of Mark .. The “Fruit of life” symbol is composed of 13 circles and is said to be the blueprint of the universe.. Shadow Penumbra Ditchburn Tripod Seat series 2 The Shadow Conspiracy Ditchburn Tripod seat is Sco.. The Shadow Conspiracy Penumbra Pivotal Mid SaddlesScott Ditchburn Signature SeatPivotal style with h..
Seat Spec:• Mid size with 3 panel• High density foam• Slim base• Hidden guts w/ reinforcednose• Weig..
John Hicks signature seat and post combo from stranger. Fixed seat and post combo available in..
- Pivotal Seatpost requiredFat padded pivotal seat with a synthetic fiber top cover and white stitch.. Specifications:Connor Keating's signature pivotal seat features his piston logo patch on a black den..
Subrosa And Shadow Collab SeatPivotal SeatWeight: 14oz ..
We had such a great response on the first Hoang Tran Easy Rider seat that we decided to kick it up a..
Subrosa rider Tom Schorb-Mergenthaler AKA Slayer Tom is a man of many talents. On this occasion, T..
Subrosa Stormwitch Tripod Seat Mid *Limited Edition*Subrosa's Stormwitch Tripod Seat is made from th.. The Tripod version provides a wide base, and thick padding. Virtually identical to its Pivotal count..
NEW Duck Canvas seat available. 3 panel canvas construction on a Fat Capital base. Sunday wo..
Sunday Jake Seeley signature seat Green Tiger Tye Die Pivital or Tripod options. ..
NEW 80's Party seats available. Jake Seeley's signature. Custom sublimated 80's inspired pa.. If the previous seats are too much for you or your customers, the new Sunday Badge seat will be ju..
Sunday's Spiro Pivotal Seat is super fat and comfy designed for gripping during barspins. ..